Easy Farmer's Market Stuffed Sourdough Loaf for Australia Day! I am freaking out Dear Reader and covered with crumbs. 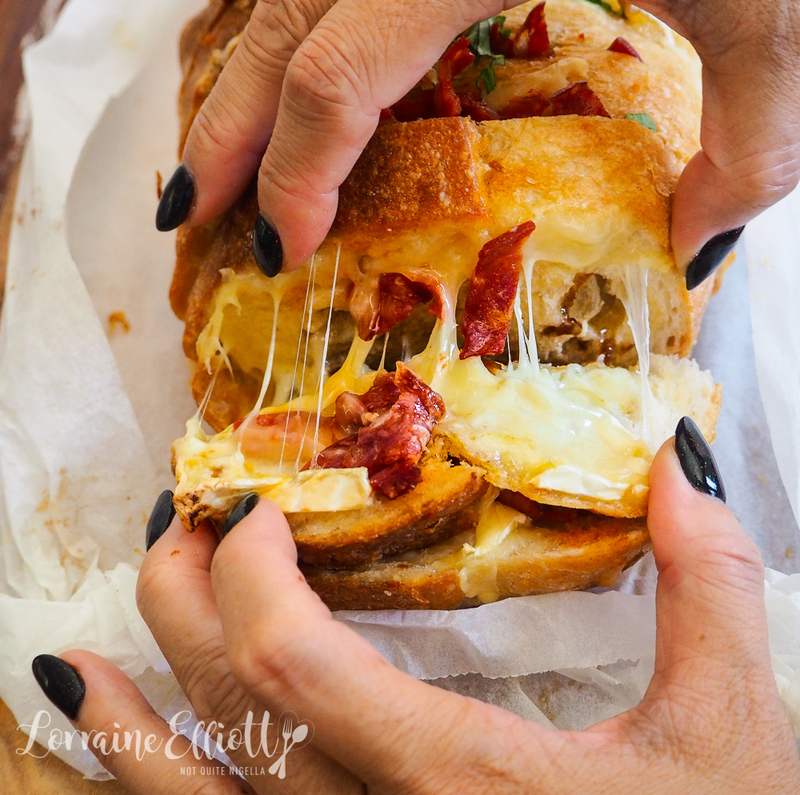 You see I just trialed this Farmer's Market cheese and chorizo stuffed bread for Australia Day coming up and it was so good that I am covered with the crumbs of said bread and cheese and chorizo oil on my fingers. A sourdough loaf is spread with chutney infused butter and then stuffed with chorizo, cheddar and brie cheese and then baked until crisp. And this is a seriously pushy recipe especially if you want to impress a crowd or if you're entertaining on Australia Day. 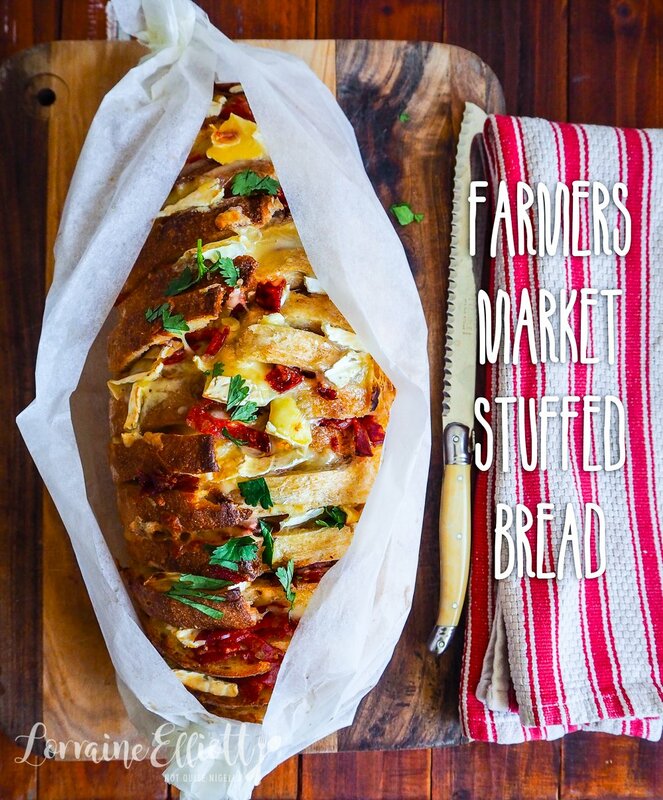 I first thought of this stuffed bread when we were travelling and went to a farmer's market. There are always certain types of stalls that always seem to be present at markets: cheese, cured meat, chutneys and jams, milk or cheese, bread and of course fruit and vegetables. So I nicknamed this farmer's market stuffed bread. Incidentally this is also great if you wanted to make something delicious with a small amount of equipment. It's a truly glorious combination. I wanted to make sure that I got the gooeyness of the cheese in the picture so I did the trial run on a weekend when Mr NQN could help me take photos of it (photographing melted cheese is difficult timing-wise). He doesn't particularly enjoy helping with the photography and videography for the blog and does so reluctantly preferring me to do it (apparently I am a perfectionist!). But it was a bit more difficult than usual that day because we had just bought a google home device that he had earlier unboxed and was playing with. It's a device that sits in your house and you basically ask it questions like "OK google, what is the weather now?" or "OK google how long will it take me to drive to Leura today?" and a voice answers hopefully with the correct answer. Technically you can get her to play things on the television and add things to a shopping list and apparently you can get the lights switched on and off too but you have to set that up and I doubt we will ever get around to it so it's just become an expensive bit of equipment to get the weather from. So Mr NQN soon ran out of things to ask her. "OK google, tell me some jokes" he said and she reeled off a list of dad jokes which he found very funny. It got to the point where I was listening to this interaction thinking, "He never asks me this many questions! And he never laughs at my jokes that much!". I'm a very jealous person and so I started to get a bit huffy. "Let me ask her something," I said bursting in on their little tête-à-tête (yes I know she's not real but hey I am possessive). I asked her to play me my favourite Lana Del Rey song and she answered, "I'm sorry I can't help you with that...". I rolled me eyes, "See!! She hates me!" I said storming off muttering something about his new wife's jokes. But back to this bread. It's really all the best flavours and textures in one. The sourdough crisps up on the outside but is soft and pillowy on the inside. The flavoured butter soaks into the bread while the melted cheese and chorizo give it gooeyness and all the flavour you need with just a few ingredients. This is really a case of an item being so much more than just a sum of its parts. So tell me Dear Reader, are you a jealous or possessive person? And do you have one of these home devices and do you find it useful? Are you making or doing anything special this Australia Day coming up? Step 1 - Preheat oven to 180C/350F and tear a large sheet of parchment and place on a baking tray. Cut incisions into the loaf making sure not to cut all the way through. Place the loaf on the parchment. In a bowl, mix the butter and chutney together and spread in the cuts on both sides. 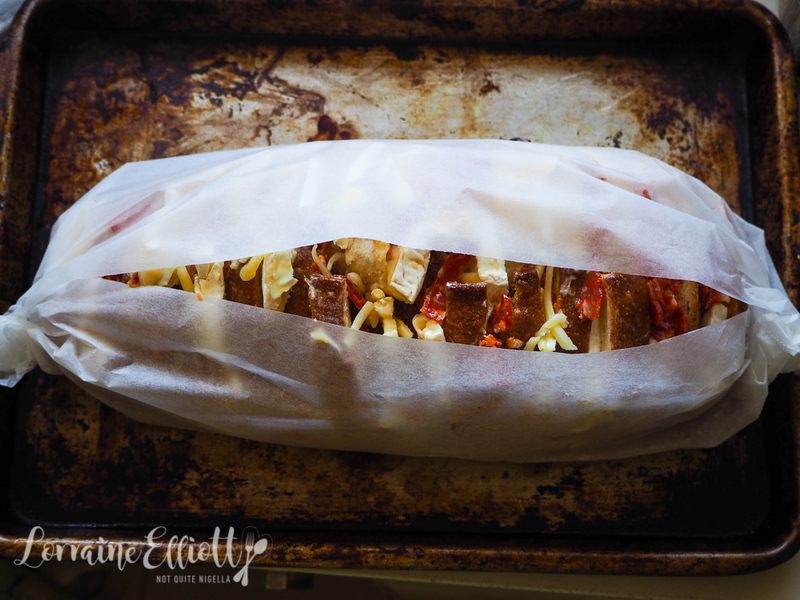 Then stuff with the grated cheese, slices of brie and chorizo making sure to stuff it in deep. Step 2 - Wrap up the parchment leaving the centre slightly exposed so that it crisps up. Bake for 25 minutes. Serve hot from the oven. featureNo Knead Cheese & Onion Beer Bread for Australia Day! 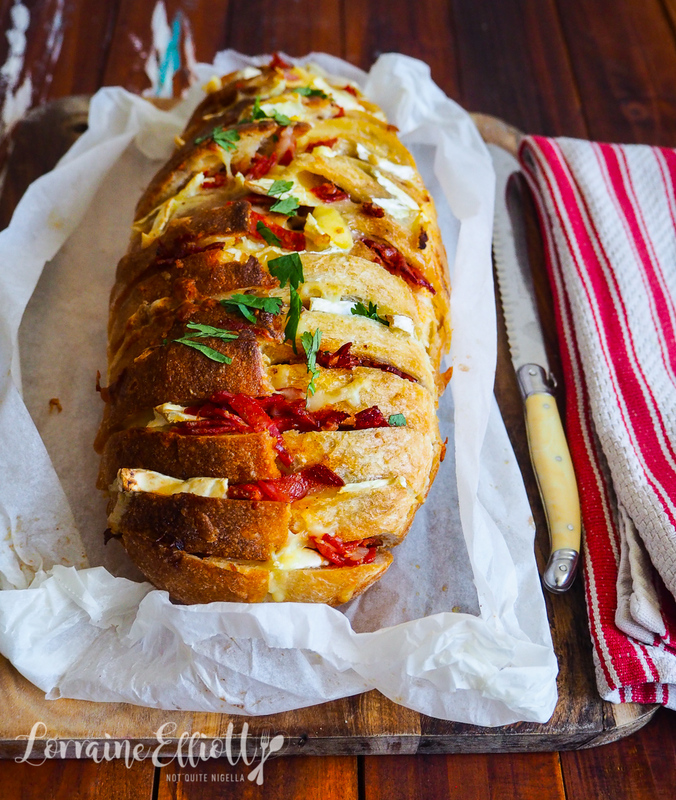 recipeThe Ultimate Chorizo & Cheese Strudel Bread! recipeThe AMAZING Easy Cheesy Vegemite Pullapart Loaf for Australia Day! recipeGiant Cheese & Vegemite Scroll! feature No Knead Cheese & Onion Beer Bread for Australia Day! 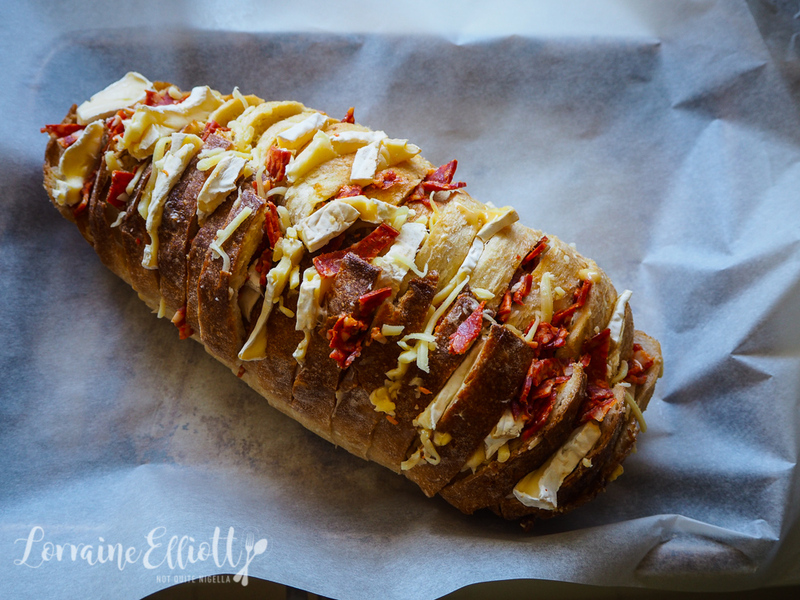 recipe The Ultimate Chorizo & Cheese Strudel Bread! recipe The AMAZING Easy Cheesy Vegemite Pullapart Loaf for Australia Day! recipe Giant Cheese & Vegemite Scroll!